There are some premises that you just know will make an absolutely great film. Rampage features a perfect example. 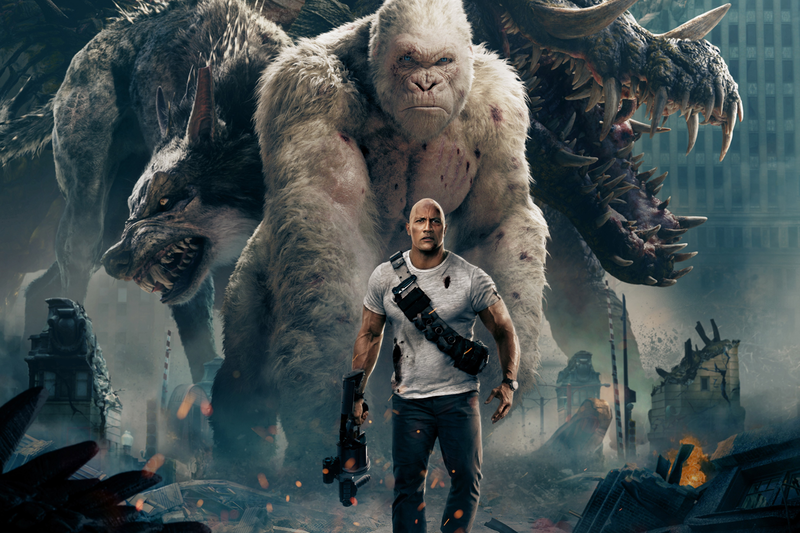 Based on the video game series by Midway Games, all you need to know about this film is all that the poster tells you – it’s Dwayne “The Rock” Johnson, and a giant mutant ape. Together, they must fight a pair of monsters that want to destroy Chicago. Now, let me go back a few sentences. It’s based on a video game. Is Rampage the film that finally breaks the video game film adaptation curse? Put it this way – the film is currently the highest rated video game adaptation on Rotten Tomatoes. That’s right. Of all video game adaptations that have graced the big screen, this is, according to critics, the very best one. And it only has 52%. In an attempt to sell this film as being more than its premise, Warner Brothers describe the film as follows…The Rock stars as primatologist Davis Okoye, a slightly introverted man who keeps people at a distance but shares an unshakable bond with George, an extraordinarily intelligent, incredibly rare albino silverback gorilla who has been in his care since he rescued the young orphan from poachers. But surprise surprise, a rogue genetic experiment goes awry and mutates this gentle giant into a raging creature of enormous size. And of course, because this is a film, it’s soon discovered there are other similarly altered animals tearing across North America, destroying everything in their path. Okoye teams with discredited geneticist Kate (Naomie Harris) to secure an antidote, fighting his way through an ever-changing battlefield, not only to halt a global catastrophe but to save the fearsome creature that was once his friend. But let’s not kid ourselves. To put it simply once again, it’s The Rock and a giant mutant ape. There’s absolutely nothing else to it – and that’s ok by me. A film like this is only as good as it’s CGI. With the CGI apes provide by Weta Digital (who were also behind the recent Planet of the Apes trilogy), you know you’re going to get some damn good apes. And damn good apes you get! Visually, this film delivers. The CGI and action sequences are all engrossing and immersive, which honestly is the most important thing with Rampage. The plot is meaningless, predictable drivel so there’s nothing to talk about there. The acting is perfectly adequate but nothing to write home about - although Negan himself, Jeffrey Dean Morgan, puts in a great performance as usual, and The Rock is as wonderful as ever. No, none of this matters. All that matters is that The Rock and a giant mutant ape are in it. The Rock and a giant mutant ape, I tell you! I have nothing much to say about Rampage. All joking aside, it’s fine. It delivers some fun thrills, but don’t expect it to rewrite the rules on the ape-based action film. But we are in historic times. There’s no arguing that this is, technically, the best video game adaptation of all time. Granted, it doesn’t have particularly strong competition, but Rampage certainly has that very exciting little fact going for it. Why it didn’t use that as its primary marketing tool, I do not know. But either way, Brad Peyton and The Rock have delivered another mindless and exciting little action adventure after 2015’s San Andreas, and I had a bloody good time with it. I think you will too. Pop the disc in, sit back, and adjust your expectations. This isn’t the sort of film that will win any awards or any high praise. But it will entertain you. What more could you possibly want from a film with very little beyond its premise of The Rock and a giant mutant ape?